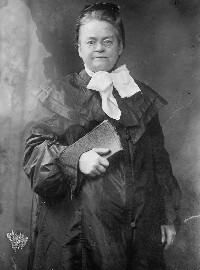 Image above: Carrie Nation. Courtesy Library of Congress. 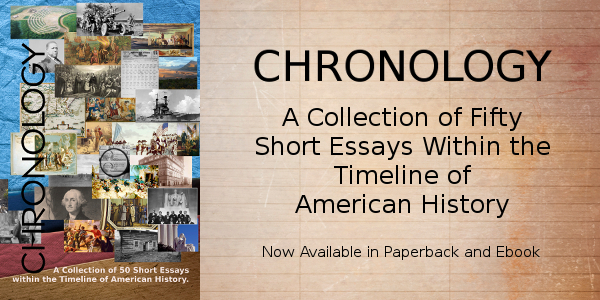 T-Shirts and Gifts from the official souvenirs of Americasbesthistory.com. Yes, the woman who took hatchets to liquor across Kansas and the midwest, prompted by a dream, and somehow eventually helped convince the United States Government to ban liquor consumption through a Constitutional Amendment, the 18th in 1919. Yes, Carrie Nation was a powerful woman. From her home in Medicine Lodge, Kansas, she would embark on a campign of smashing saloons from that dream forward, some say more than two dozen, and today, you can visit the small part of Americana in a compact museum dedicated to the temperance woman, plus a Stockade Museum next door. Both of these are unique representations of their subjects, and worth a visit if you happen to be in the Medicine Lodge area. Photo above: Carrie Nation Home, 2017. Courtesy Wikipedia Commons. 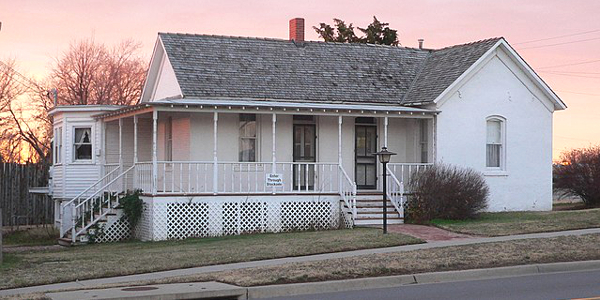 By the time Carrie Nation moved to this home in Medicine Lodge, Kansas in 1889, the sale of alcohol had been banned in Kansas through a state Constitutional Amendment for eight years. However, it had not been adhered to. There had been efforts through the Women's Temperance Association prior to Carrie Nation's dream to make that point; she had smashed the tavern of Mart Strong with Mrs. Wesley Cain in 1899 and the O.L. 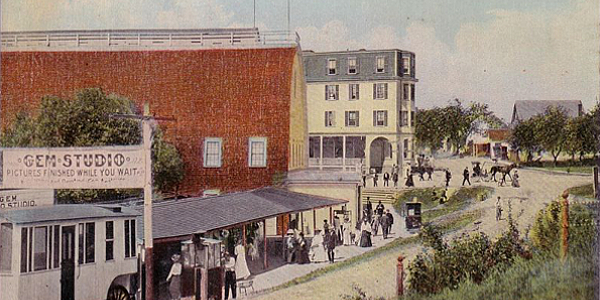 Day Pharmacy in February 1900. But it was the dream of June 5, 1900 (date in debate) that prompted a series of saloon smashing, beginning in Kiowa, Kansas nearby the next day. Three in Kiowa on June 6; first use of hatchet on December 27 at the Hotel Carey saloon in Wichita. The next year, Carrie Nation and her followers continued their destruction in the Kansas cities of Wichita, Enterprise, and Topeka. The Topeka saloon was a favorite of Kansas legislators, and her Topeka visit coincided two days later with speeches to both houses of the Kansas government. She was not done. Throughout the next year and beyond, Nation and her followers would smash liquor in dozens of saloons. The acts spread outside Kansas as well, including the Hotel Holly seven years later on August 28, 1908 in Michigan. Nation was arrested more than thirty times between 1900 and 1910 for her actions. She sold the home in Medicine Lodge in 1902. It was declared a National Historic Landmark in 1976. 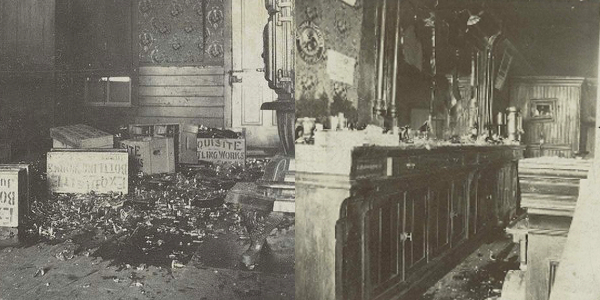 Photo above: Montage of two photos, (left) destruction of an Enterprise, Kansas saloon in 1901 by Carrie Nation, (right) Destruction of the Enterprise, Kansas bar, 1901. Courtesy Kansas Historical Society. 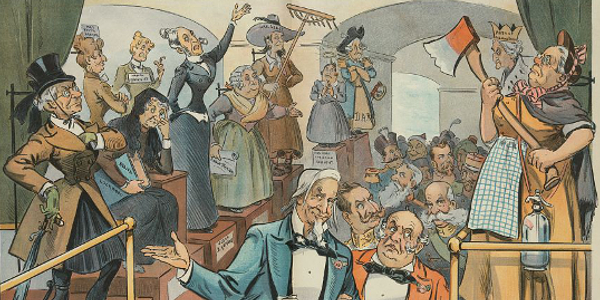 Below: Carrie Nation on the right holding her axe and the suffragette movement on the left, Louis Dalrymple, 1901, J. Ottmann Lithograph Co. Courtesy Library of Congress. Carrie Nation Home and the Stockade Museum are located in Medicine Lodge, Kansas at 209 W. Fowler Ave. Fowler Avenue is Route 160. Accommodations nearby include a Budget Host Inn and Copa Budget Inn. 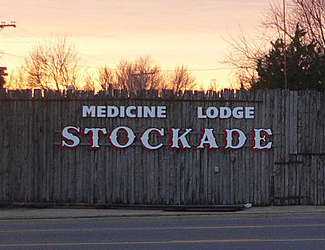 Medicine Lodge is about one and one half hour driving time from Witchita, southwest direction, eighty-five to ninety-five miles, depending on your route. Original Carrie Nation home with exhibits about her life and temperance times. The Stockade Museum has a rebuilt fort, 1961, of the 1874 stockade that protected Medicine Lodge settlers from the surrounding tribes. Inside the stockade are the Smith Cabin and an Old Steel Jail. 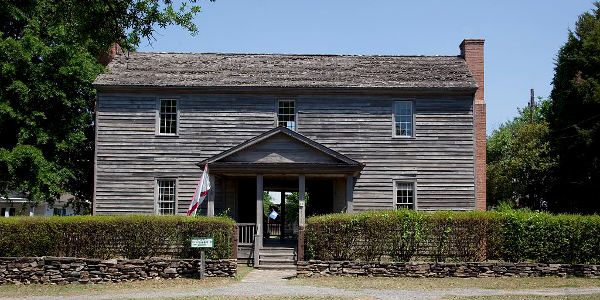 Tickets get you into both the Stockade Museum and Carrie Nation Home. Open daily June to October; Thursday to Sunday other months. $5 Adults, $3 children, under 7 free. From the National Park history standpoint, Kansas is a bit spare. West of this location you have Fort Larned, and northeast you get Brown vs. Board of Education National Historic Site and Tallgrass Prairie Preserve. On the smaller side of history and outdoor vacation pursuits, this area of Kansas includes Botanica, the Wichita Gardens, the Hooray Ranch, Kingman State Fishing Lake, the Bartlett Arboretum, and Heartland Farm. One entry from early 1900 states the mindset of Carrie Nation as she lives in Medicine Lodge, Kansas. This is a beautiful bloom on thy cheek. Their, a beautiful bloom on my cheek. It has been just 3 years since I made the last entry. I left Texas 1888 lived in Medicine Lodge several years Then went to the Cheyenne County took a claim after living there three years Sold out and moved back to Medicine [Lodge] in Oct 17 1889 and I believe we are now settled for life. Carrie Moore daughter has been with us since Nov. 1898 she is now 13 years old Charlien has [had] six children two of which are not-for God took them Saved little [Mary Elizabeth and a precious little boy 6 days old Oh have them with me through the happy eternity Lola has three boys and one girl and Charlien has three girls and one boy. I will try and write oftener in my diary I have been studying Osteopathy and practice some am treating Little Bessie [Stuaret] and the Stevens Next week I go [to] Shurin Hasletin] and Kiowa to organize As I am Co. President of Barber of the W.C.T.U. 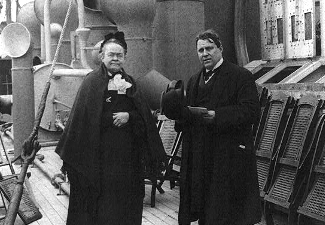 Photo above: Carrie Nation and gentleman in 1904 image. Photo courtesy Library of Congress. Various sources state that this dream occurred on June 1-5, 1900, and prompted her raids on three saloons in Kiowa on June 6-7. Some sources state that this may have happened in 1899. Believe what you want; we prefer the 1900 date, but are not sure why. 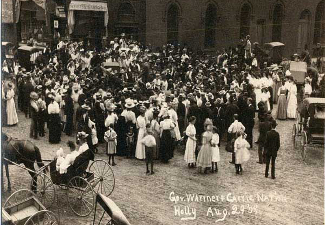 Photo above: Governor Fred Warner speaking to the townspeople of Holly, Michigan on August 29, 1908, while Carrie Nation was in jail for smashing the Holly Hotel saloon. Photo courtesy Holly Hotel. In 1874, the residents and militia of Medicine Lodge built a large stockade, three times the replica that stands today. It was meant to protect them from the predators of the prairie, both man, Indian raids, and beast, and stood nine feet tall. The location was northeast of today's spot near the center of town and could hold two hundred people. 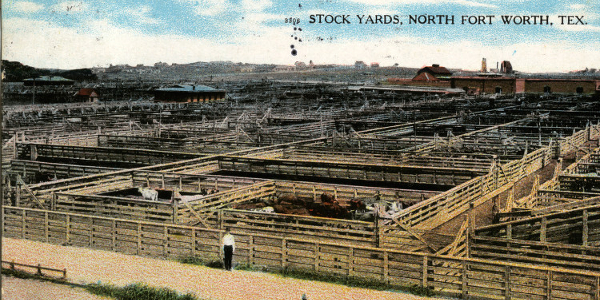 The current stockade was built in 1961. Inside the stockade, exhibits include the Robert Smith Log House, built in 1871 fourteen miles away and transported here. There is also an Old Steel Jail, built 1886, from the courthouse, plus exhibits on the Bank Robbery of Medicine Lodge in 1884. 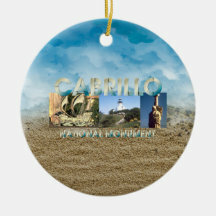 The site contains a gift shop, and there are special days held throughout the year on various topics, including a Peace Treaty Weekend, usually held in September. Photo above: Medicine Lodge Stockade Museum, 2017. Courtesy Wikipedia Commons.